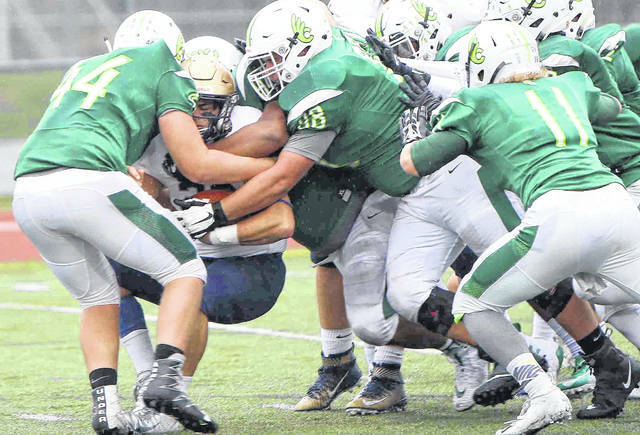 Wilmington College’s Weston Trampler (44), Tyler Bray (98) and Ronald Hill (11) tackle a John Carroll ball carrier during Saturday’s game at Townsend Field. 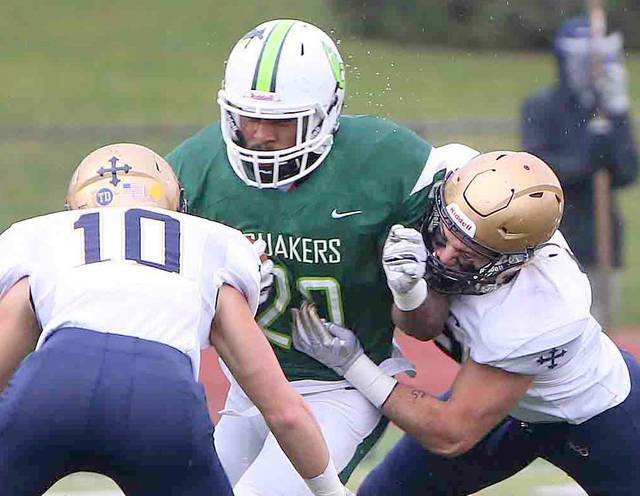 Scoring nine touchdowns and rushing for more than 600 yards, the John Carroll Blue Streaks handily defeated Wilmington College, 66-19, Saturday in Ohio Athletic Conference action at Townsend Field. The Blue Streaks (7-1 overall, 6-1 OAC) came into the contest No. 9 in the country according to D3 Football.com, and unleashed an offensive display against the Quakers with 645 yards. Wilmington (1-7, 0-7 OAC) was held to just 269 yards offensively, with 220 yards in the air. The Quakers were unable to establish any type of running attack and finished with just 49 yards on 32 attempts. DJ Chambers had the most yards with 24 on 11 carries. John Carroll grabbed a 14-0 lead at the first quarter break, and outscored the Quakers 17-6 in the second to take a 31-6 lead at halftime. The Quakers’ first half points came on a pair of Tyler Butcher field goals of 35 and 43 yards, the final of which came with 30 seconds to play in the half. Wilmington started the third quarter with a 74-yard scoring play, when Kyle Barrett hooked up with Luke Richardson. 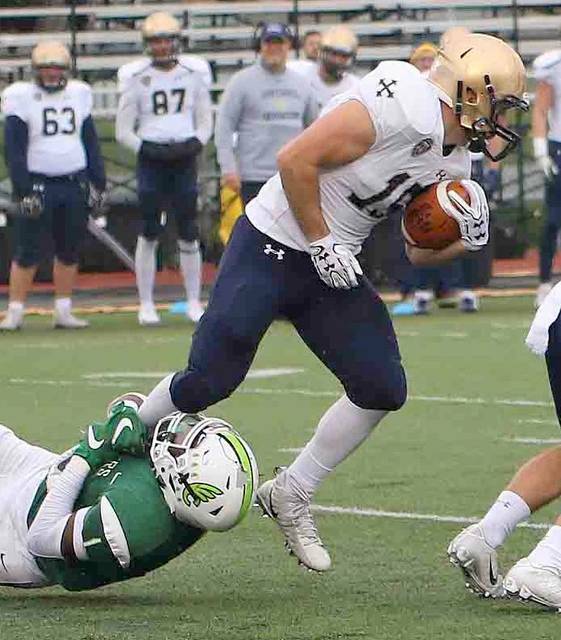 Richardson eluded a would-be JCU tackler and rambled the distance to the end zone. Butcher converted the PAT, making it a 31-13 contest. Richardson had two receptions on the day for 97 total yards. Wilmington added a fourth quarter touchdown, a 71-yard pass from backup quarterback Samuel Coleman to receiver De’Anta Sanon with 12:24 to play. 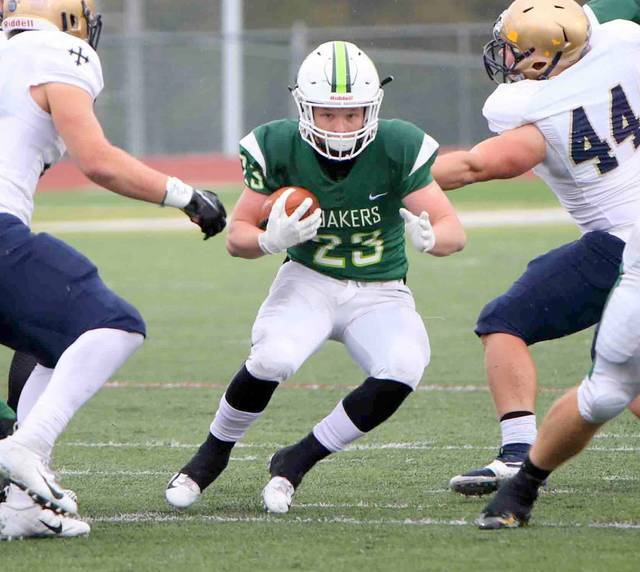 John Carroll had a trio of running backs with more than 125 yards individually on the ground. 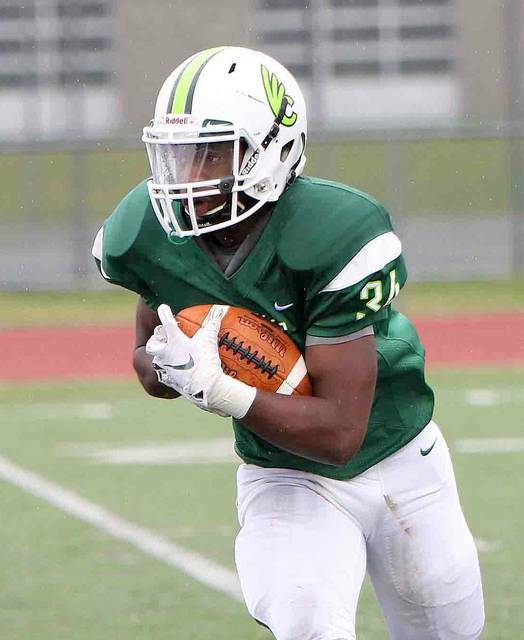 Josh DeLozier had 184 yards on 21 attempts and four touchdowns, Devin Limerick generated 152 yards on 13 carries, and Michael Canganelli, who scored three touchdowns, added 128 yards on 21 carries. On the defensive side of the ball, Wilmington’s Tre’Quez Parks had 15 tackles and forced a fumble. Tavion Bryant added eight tackles for the Quakers. The Quakers will be on the road Nov. 3 at Capital. The Crusaders (1-7, 1-6 OAC) notched their first victory of the season, defeating Otterbein 23-19. 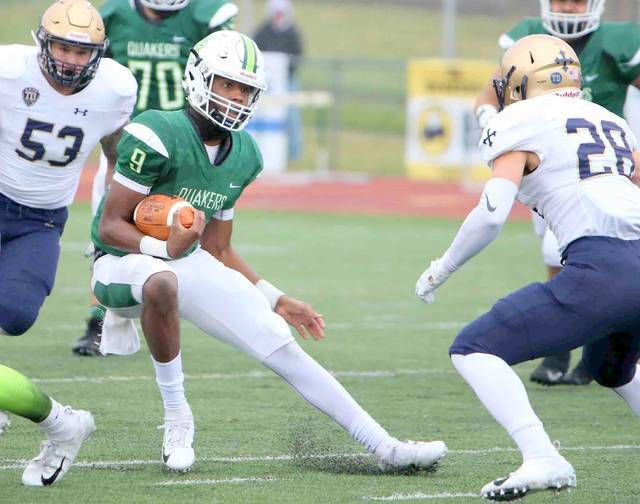 Wilmington then returns to Williams Stadium for its 2019 season finale, hosting Otterbein Nov. 10 for Senior Day. JCU-Canganelli, 6-yd.run. Danko PAT good 9;59. JCU-DeLozier, 6-yd. run. Danko PAT good 4:04. JCU-Danko, 35-yd. field goal 14:16. JCU-Canganelli, 3-yd. rush. Danko PAT good 10:47. WC-Butcher, 35-yd. field goal 6:52. JCU-Canganelli-1 yd. rush. Danko PAT good 3:48. WC-Butcher, 43-yard field goal 0:30. JCU-DeLozier, 9-yd. pass from Moeglin. Danko PAT kick 7:59. JCU-DeLozier, 20-yd. rush Danko PAT 2:13. JCU-DeLozier, 5-yd. rush Danko Pat 14:13. WC-Sanon, 71-yd. pass from Coleman. PAT kick failed 12:24. JCU-Larkin, 69-yd. rush. Danko PAT 11:33. JCU-DeLozier, 70-yd. rush. Danko PAT 8:07. Bill Liermann covers college and high school sports for the News Journal. Follow him on Twitter @lierjet.